This Simple Macaroni Salad Recipe is filled with all the classic ingredients, tossed in a creamy sauce and perfect for summer potlucks and parties! Cook the noodles according to package instructions, then drain and rinse with cool water. I like to add a few ice cubes to the noodles while running cool water over them to help cool the noodles faster. Drain and add pasta to a large bowl. Add in the diced celery, red onion, red bell pepper, peas and cheese. Whisk together the dressing ingredients in a small bowl until smooth and creamy. Pour the dressing into the large bowl and stir to coat evenly. Keep the salad covered and refrigerated until ready to serve. Enjoy! 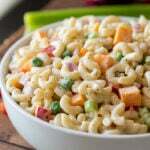 Macaroni Salad Recipe can be made up to a day ahead of time. Keep refrigerated and stir just before serving.